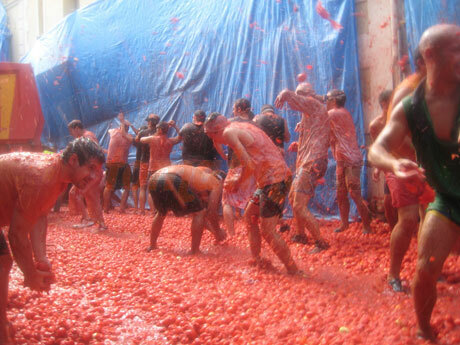 Although the Tomatina is a funny war, it is necessary to respect the rules of the battle. It is forbidden to enter the enclosure with bottles or strong objects. You cannot throw anything that is not tomatoes and you can only throw it at the set time (from 11:00 to 12:00). You must crush the tomatoes before throwing them, so they do not hurt anyone. Pay attention to trucks that throw tomatoes, keep your distance and be careful with them. You cannot push people, as well as stretch the t-shirts. Break them or take them off. It always takes place the last Wednesday of August. It starts at 11:00 and ends at 12:00. Two firecrackers signal the beginning and end of the war. It is forbidden to throw tomatoes outside these hours. Remember that you cannot enter with strong objects, like backpacks, bags, cameras, etc. We also recommend that you keep your ID securely and access the site with a certified copy. We recommend dressing in comfortably and old clothes: closed shoes and sportswear. After the battle, you probably have to throw it away. It would also be advisable to use protective goggle (like diving goggles) and gloves. To avoid last-minute problems, you should be in Buñol at 7 in the morning, at this time the accesses in the car to the town centre will be closed. Although there are security personnel that looks after the interests of the participants, we recommend that you do not lose your personal belongings.